54cm Stainless Steel Freestanding Cooker is rated 4.5 out of 5 by 13. 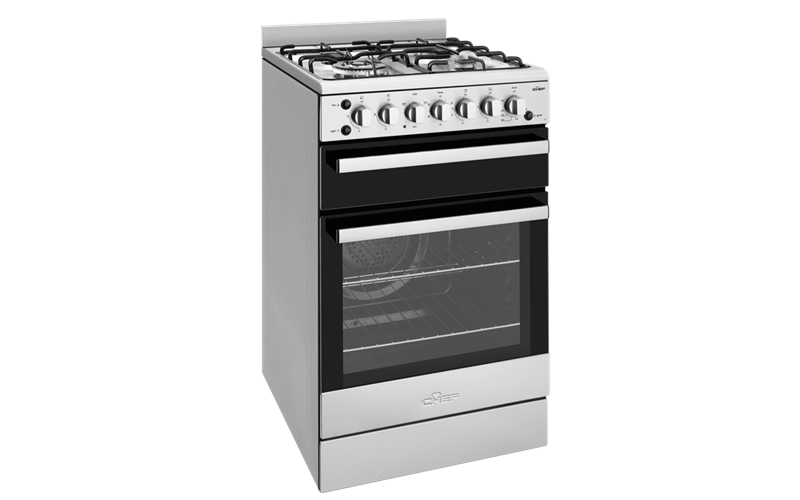 54cm Stainless steel freestanding cooker with fan oven, timer, light, electronic ignition, separate electric grill and 4 burner gas hob with wok burner. Enhance the look of your kitchen with a Chef freestanding cooker. Now available in a stylish stainless steel finish, you can enjoy a sleek built-in oven aesthetic with full glass doors and a grill in the oven. Rated 4 out of 5 by Buglet from Reliable - a good basic stove I bought this before Christmas to replace a very basic white Chef stove with no oven fan and no stovetop ignition - possibly the most basic model (I am in rented accommodation). The oven button had stuck, making the oven unusable, and our lovely landlord agreed to an upgrade. The new model is a step up and is still a fairly simple model but so far so good. Easy to use and clean, reliable, looks good, oven works well, easy and quick to ignite. It does everything I need it to do without any drama. The only comment I would have is that the stove top burners have the standard ones at the back and the big and small ones at the front - and since I use the standard ones most, that's a bit of a pain. Other than that, though, all good. Rated 5 out of 5 by Glenda Clifford from Totally happy I bought this stove a couple of months ago and am completely happy with it. All surfaces are easy to clean. 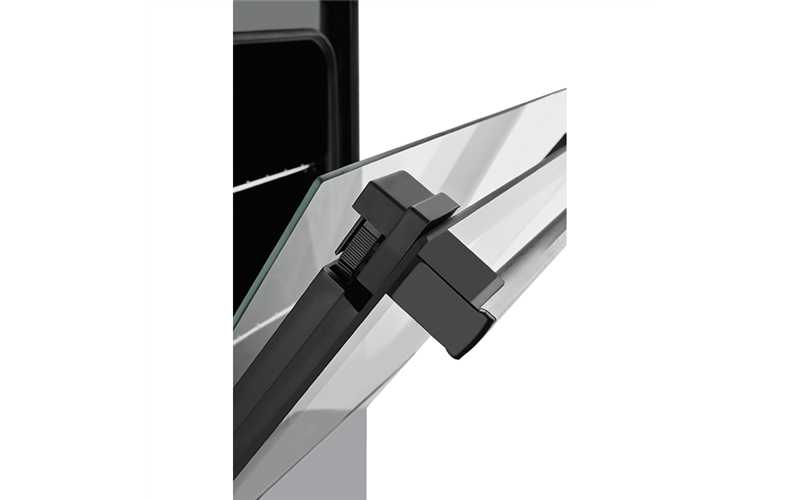 I especially love the simple clip out inner glass panel which can be completely removed for cleaning. The size and layout of the burners are great. The oven capacity is really good and cooks food evenly. It heats very quickly and the outer sides do get hot so make sure if you build it in that the cabinetry is rated to withstand 85 deg C as noted in the instructions. A great purchase and my favourite feature is that it is an Australian product! Rated 5 out of 5 by Eugene_Keysborough from definitely a winner WE bought this stove 2 months ago to replace the old one (do not remember the brand). 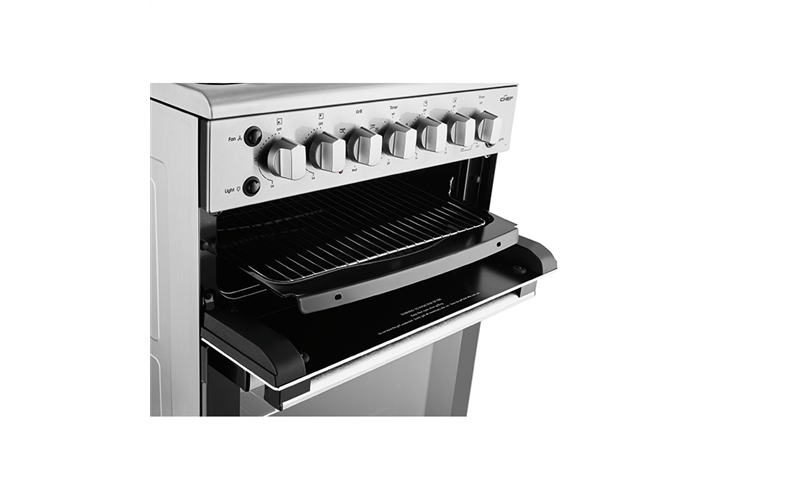 We chose this model for the overall quality and such features as an oven fan and the metal finish. Finally, our food is cooked evenly on both shelves in the oven thanks to the forced air circulation. The temperature gauge is more accurate. The oven can reach higher temperatures if needed. The top is cleaned easily. We bought the oven with the installation and are happy about it. The guy who was doing the delivery, was also a certified gas installer. Everything was done efficiently, fast, clean. Rubbish has been removed. The installer can do additional jobs like fitting a flexible gas pipe extension so you can remove the stove for cleaning later, if you need. Well done ! Rated 5 out of 5 by Lizz1e from Love the look, so easy to clean, brilliant oven. We bought this a month ago and l wish we had done so a year ago! I now realise how bad my old oven was. We had one of the guys from Appliances Online do all the gas connections when they delivered it, which made our life so easy! No wonder we continue to buy from and recommend Appliances Online! Thanks guys! Rated 4 out of 5 by innocent city cat from good stove with all the featuresI need I bought this a month ago; its four burner cooktop is enough for any meal; the oven works well, and the fan-forced option is a plus; it's easy to keep clean. Rated 5 out of 5 by George and Elizabeth from We are very happy with our stove and we have and we'll recommend Appliances Online to our family and friends your the Legends thanks, regards George.